I run and work out more often than I hike, hence, I have never called myself as a “hiker”. Occasionally, I do enjoy being disconnected and off the grid for a few hours, and I find that Gunung Nuang is one of my favourite places to “escape” (it feels like a quick holiday!). As beginner, I learnt the hard way about some of the items that you must have. 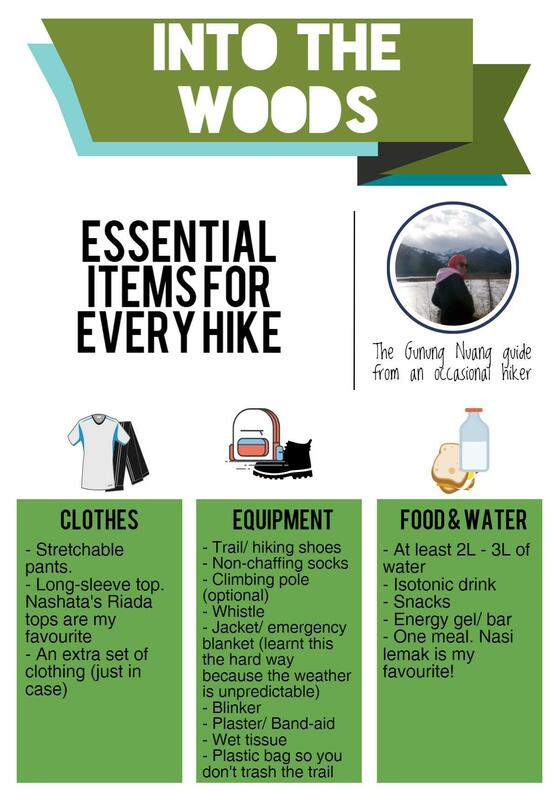 Based on my limited knowledge, I think that this list is very basic, yet I am still finding a balance between packing light and being prepared. Let me know what you think, and I’ll add on more to the list! Disclaimer: This list is only suitable for day trips, not for overnight stays. The Weekender Runner and Newbie Hiker.